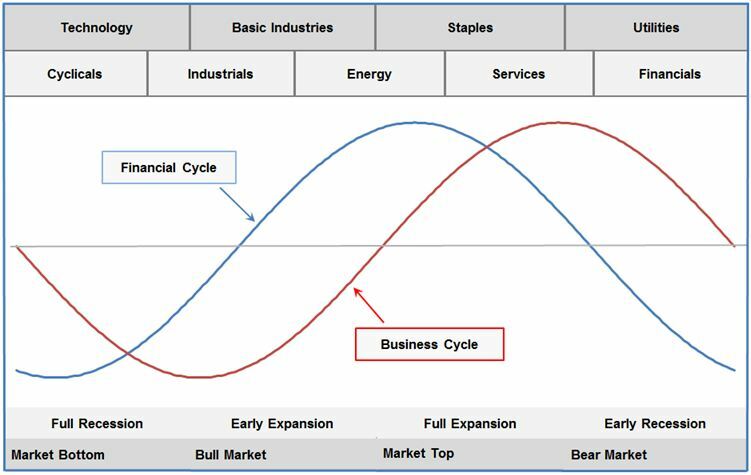 The analysis is used to practice “sector rotation,” i.e., put new money to work in the stock sectors thought to perform well at that particular stage of the financial cycle, and allocate away from sectors that are positioned to do poorly. The most highly weighted leading indicator, Average Length of the Manufacturing Workweek, measures the average number of hours worked in a week for US manufacturing employees. Emerging from the 2008 recession, the metric successfully led the market uptrend beginning in May of 2009, shortly before the recession had officially ended. Since that time, the measure has stabilized to its pre-2008 recession levels. 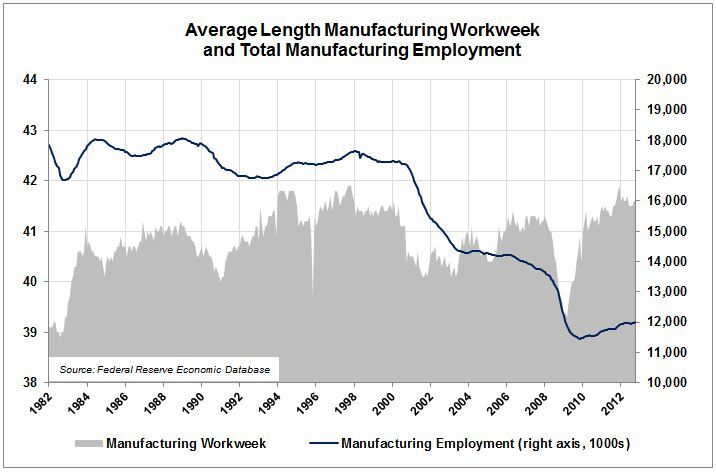 It is interesting to note that, although the number of hours in a workweek remains stable, total manufacturing employment has been in a dramatic downtrend that started before the 2008 recession. 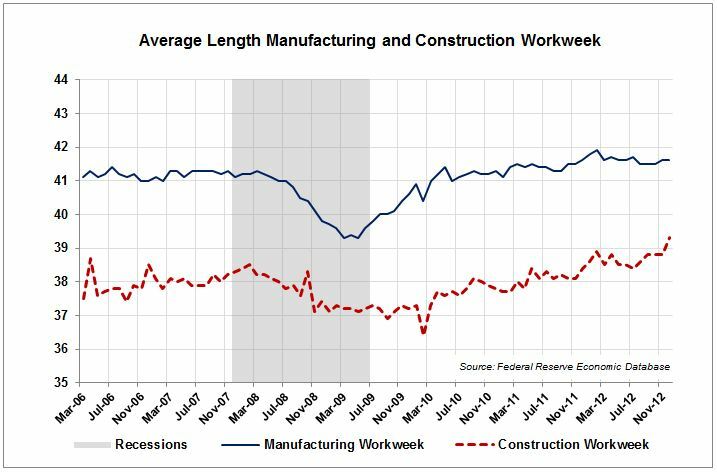 Overall, it appears that the Average Length Manufacturing Workweek indicator has established a “new normal”, evidenced by stability in the number of hours worked, but a significant decrease in total manufacturing employment. The indicator is rated zero. The ISM New Manufacturing Orders Index is a diffusion index that measures the number of manufacturing orders received by US manufacturers. The index has been highly volatile over the past 20 years, which has hampered its ability to effectively act as a leading indicator. Immediately after the close of the most recent recession, the metric returned to levels sustained prior to the downturn in the economy, but has been balancing itself around the 50 mark throughout the last 18 months. It should be noted the short-term trend in the diffusion index is beginning to mirror the trends prior to the 2001 and 2008 US recessions. 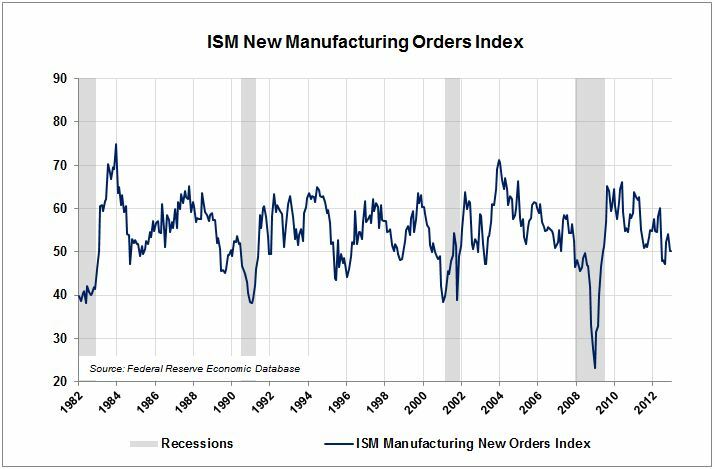 Given its sustained trend of volatility, the ISM New Manufacturing Orders Index is expected to continue fluctuating around the 50 mark, which could signal the beginning of a new economic recession if there is any further decline in the index. This indicator merits a -1. Reflecting the changes in consumer preferences within the economy, the Consumer Sentiment Index is one of the few economic indicators that is expectations-based. Just prior to the 2008 recession, the index had some marked volatility, but was more stable until around 2007, when a sharp decrease signaled an economic recession. Notice in late 2012 the index dropped sharply, indicating that consumer confidence in the US economy has still been fairly negative since the end of the most recent recession. Despite a relatively upward trend in the Consumer Sentiment Index, the growth has been much slower than in prior years. 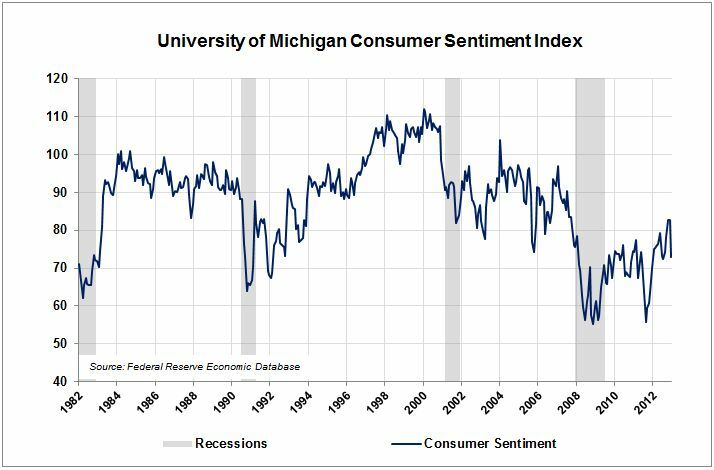 Overall, the Consumer Sentiment Index is expected to remain stable or begin a downward trend, as consumer confidence in the economy remains at a low point since the commencement of the 2008 recession. This indicator warrants a score of zero. The interest rate spread, also known as the yield curve, measures the difference between 10-year Treasury bond rates and the overnight federal fund rates. The slope of the yield curve is primarily influenced by the Federal Reserve Board’s monetary policy and investor expectations of long-term interest rates. In previous business cycles, the interest rate spread has been relatively effective in signaling economic changes; however, in 2008, the metric appeared to lead the recession too early on. 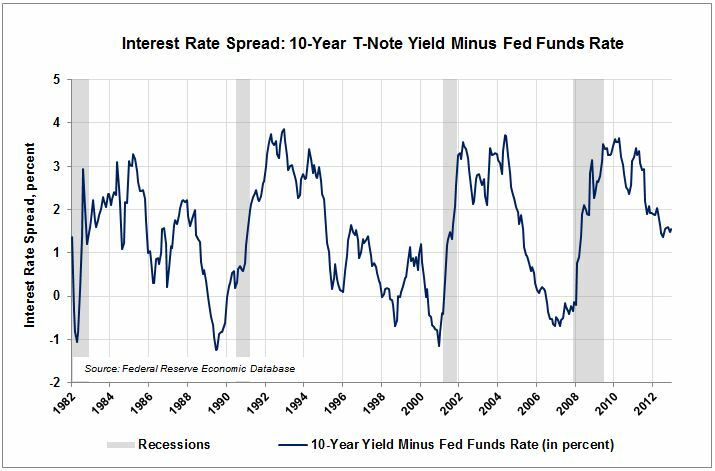 Since the close of the recession, the spread has been trending downward, but has remained stable at 1.5%. Overall, given that interest rates are expected to remain low, the interest rate spread is expected to either remain stable or slightly decline over the next 6-9 months, which would send a negative signal regarding future economic growth. This indicator is scored zero. Measuring the amount of new durable goods ordered by consumers, the nominal and real durable goods orders chart tracks the money spent on items with larger price tags and longer lives. While the chart dropped off severely prior to the 2001 recession, it seemed to take longer to adjust and drop in 2008. 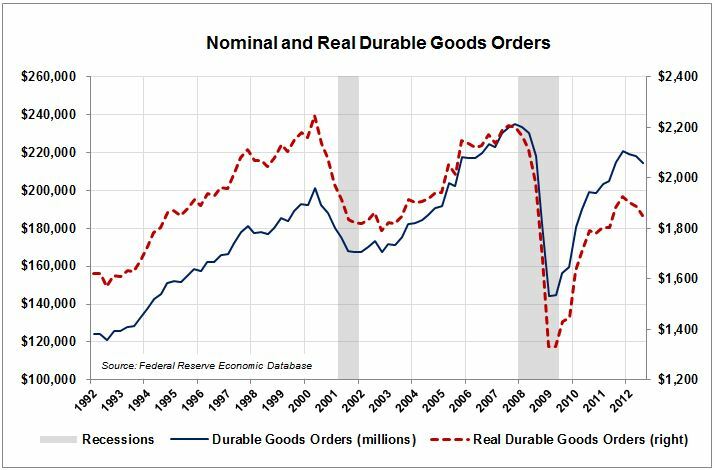 Notice that the peak in 2011 for durable goods orders was far below the previous peaks in 2007 and 2000, indicating that while some consumers are ready to purchase items for the long run, others are still wary of economic conditions. After the 2008 recession, orders increased quickly until 2012; from 2012 to the present, there has been a steady decline, which could predict further contraction of durable goods ordered. As the 2011 peak’s downslope is not nearly as sharp as the peak in 2000, one could assume that the market is simply adjusting and the downward movement seen recently will be offset by some upward movement. Therefore, this indicator merits a zero rating. The Chicago Federal Reserve Board (FRB) diffusion index measures how easy or tight credit conditions are in the US. As the value trends downward past zero, the ability for an individual to borrow money in the US becomes easier, characterized by loosened credit restrictions. Just prior to the most recent recession, this indicator peaked just as the recessions was considered to have begun, unsuccessfully indicating a downturn in the economy. The Chicago FRB diffusion index fell approximately 300bps to a low of -1.5% just after 2010 and has slowly recovered. Given the Federal Reserve’s current policy, characterized by ongoing low interest rates since the end of the 2008 recession, the index has been only increasing slightly. Consequently, the Federal Reserve Bank is expected to keep interest rates very low over the 6-9 months, which concludes that the Chicago FRB diffusion index will continue on its slow trend upwards, but will remain below zero, indicating continued loose credit conditions. This indicator will be rated +1. Since stock prices are thought to be forward-looking discounting mechanisms, it is easy to conclude that stock prices should lead the economy. While both the 1991 and 2001 recessions were successfully predicted by this indicator, the recovery in 2002 actually lagged behind until 2003. Notice that we have been in a secular bear market for the last 12 years after stock prices are adjusted for inflation. 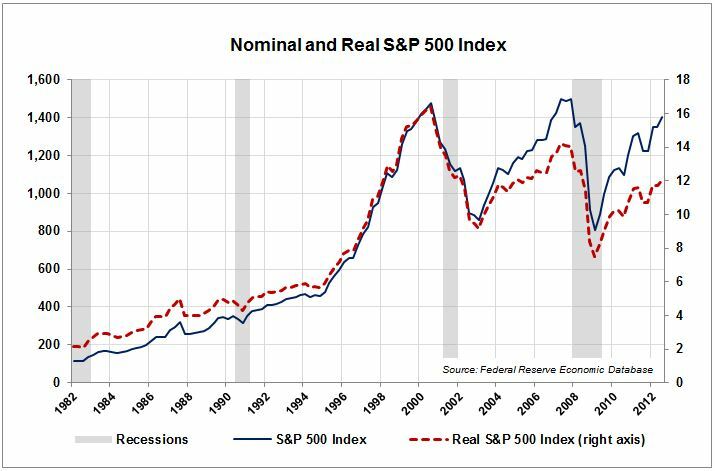 This means that, while the real stock prices do have a recovery period during the expansion, the peaks have fallen progressively lower in the expansions following the 2001 and 2008 recessions. The most important thing to realize is that right now, the stock market is trending up; though it may not be an explosion of upward momentum, it has been rising since mid-2012 and has not taken a downturn yet. Given the slow trend in the real S&P 500, this indicator merits a score of zero. 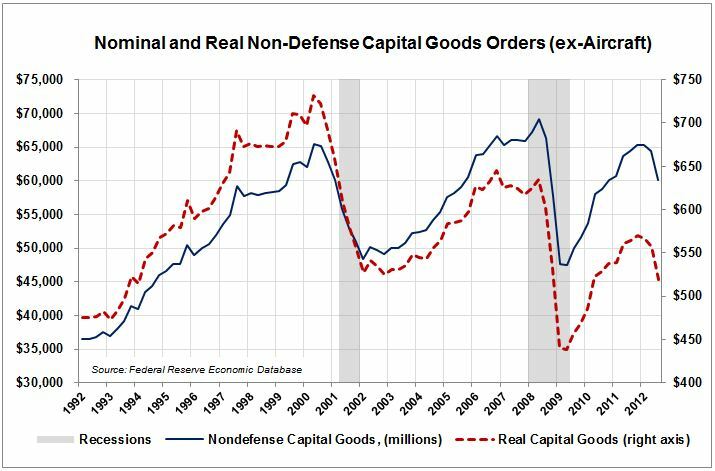 The Capital Goods Orders graph shows spending on capital goods by US businesses. Though the series predicted an economic downturn in 2008, the capital goods orders almost missed the 2008 recession entirely; it was lagging at the beginning of the recession and barely had an upturn before the recession ended. Notice that, although the real line peaks in both 2008 and 2011, these peaks are not even close to the previous high point realized in 2001. The graph shows that capital investments have been contracting for the whole year of 2012 and capital investments have been generally shrinking since 2000. Overall, as we just had a peak in 2011 and these peaks are followed by troughs, further contraction of capital investment can be expected. Consequently, this indicator will be rated -1. The Average Weekly Initial Unemployment Claims leading indicator measures the number of people filing for new unemployment benefits. 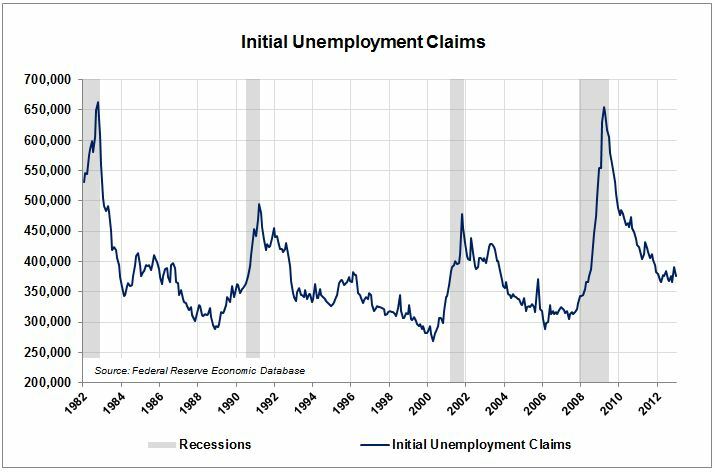 The indicator has an anti-cyclical relationship with the business cycle; a low number of unemployment claims indicates the economy is expanding. In recent years, it has been a relevant indicator in illustrating the economy‘s downward spiral during the 2008 economic recession. Prior to the past 2001 and 2008 recessions, weekly unemployment claims remained low until sharply increasing in the months leading up to the economic recessions. As seen in the graph above, the amount of claims has dropped tremendously since its peak in 2009. Notice how the metric is currently balancing around 375,000 per week, which appears to be relatively high compared to the 1990s. Although comparatively high, recent months show a slight downward trend of average weekly unemployment claims, indicating the economy is slowly recovering from the 2008 recession. The indicator will be given a rating of zero. This indicator measures the number of new private housing construction permits requested by home builders. Prior to the 2008 recession, the number of building permits gradually declined, successfully indicating a recession was about to surface. 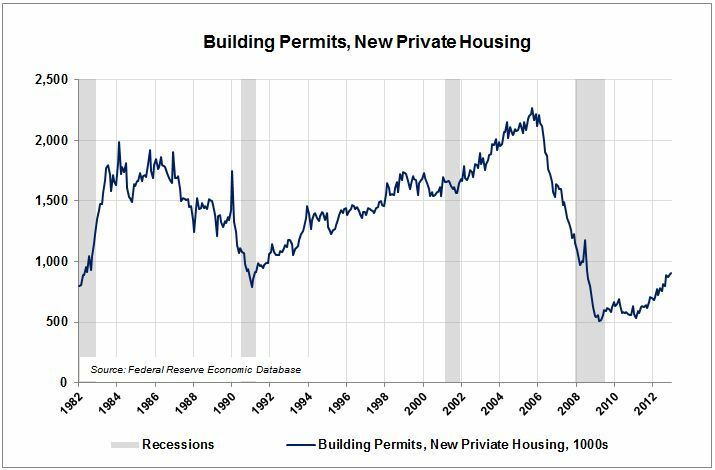 It is also interesting to note that during the last recession in 2008-2009 the number of new housing building permits reached a 30-year low. Reviewing the metric’s trend over the past few years, steady growth in the number of permits authorized represents a strengthening economy. Overall, the number of building permits for new private housing has yet to surpass pre-recession levels, but is expected to remain trending upward over the near-term. Therefore, this indicator will be rated at zero. Coincident Indicators. 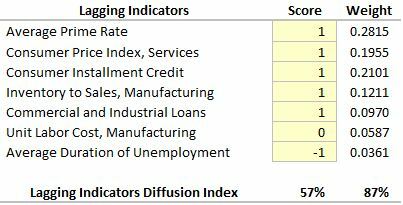 The students’ rankings for the Conference Board’s four coincident indicators are shown in the table below; detailed notes on each indicator follow. The indicator of manufacturing and trade sales is a coincident indicator that measures the total retail sales and real total retail sales (accounting for inflation). This indicator acted as a leading indicator in piror business cycles, and as a coincident indicator in more recent years. 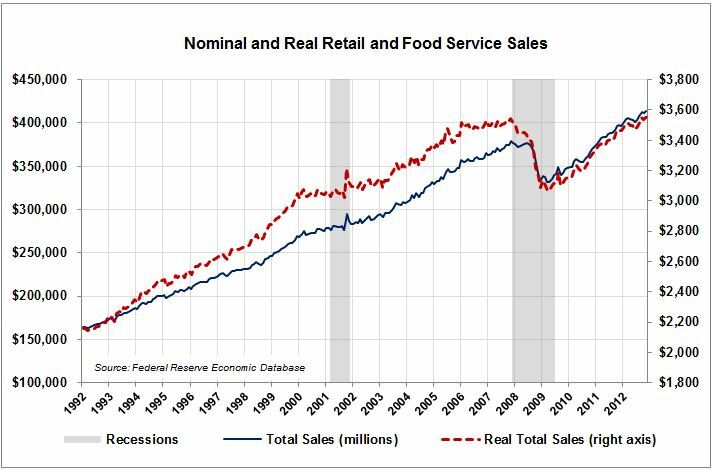 Both total retail sales and real total retail sales have been on a steady rise since 1992. Total retail sales surpassed real total sales during the 2008-2009 recession. The steady uptrend indicates a growing economy. Retail sales have resumed normal rate of growth since the 2008-2009 recession and are showing a full recovery. This indicator therefore merits a diffusion index score of +1. Total nonfarm payrolls is a coincident indicator that measures the total number of people in the US with a fulltime/part time job, temporarily or permanent. The total number of nonfarm payrolls has decreased during the recession (2008-2010) but increased since 2010. Total nonfarm payrolls is getting back to the level that it achieved before the recession. The overall trend is going upward. The upward trend and steady increase of the total nonfarm payrolls is indicating a recovering market and economic expansion. 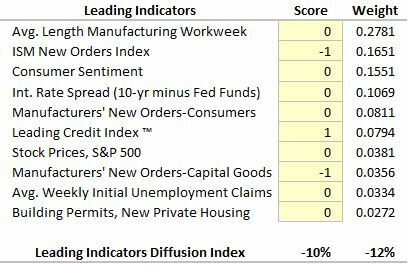 For this reason the coincident indicator nonfarm payrolls gets a diffusion index of +1. Personal income less transfer payments is a coincident indicator measuring the extent to which income in the US is growing from market base sources excluding any government redistribution of income. US GDP grows by a greater amount when consumers’ spend freely. Personal income is the main source of spending. Transfer payments are redistributions of tax revenues by the government including social security, welfare and business subsidies. The indicator lagged true economic conditions by several months, for instance during the last recession (2008-2010), when it reflected the overall economic situation two months late. Nevertheless, personal income less transfer payments is at an all-time high and increasing. Therefore personal income less transfer payments will receive a diffusion indicator score of +1. 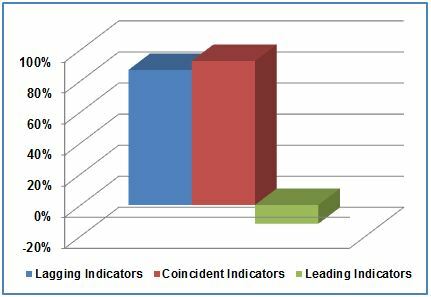 The index of Industrial production is a coincident indicator which measures physical output at all stages of production in the manufacturing, mining, gas and electric industries. 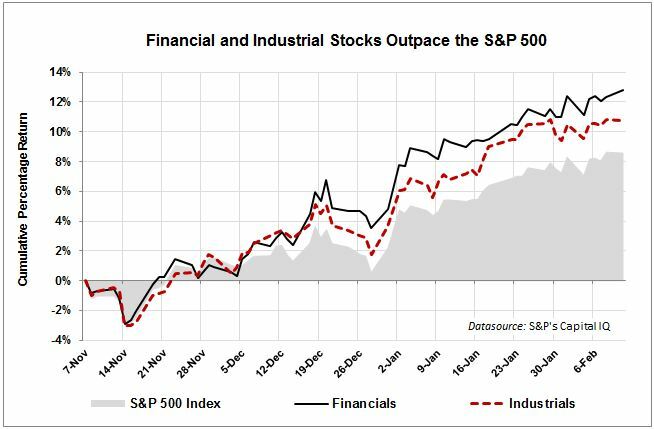 Although the industrial sector only represents a fraction of the total economy, this index is positively correlated with changes in total output. The nominal works well as a coincident indicator, increasing and decreasing in sync with economic expansions and contractions. 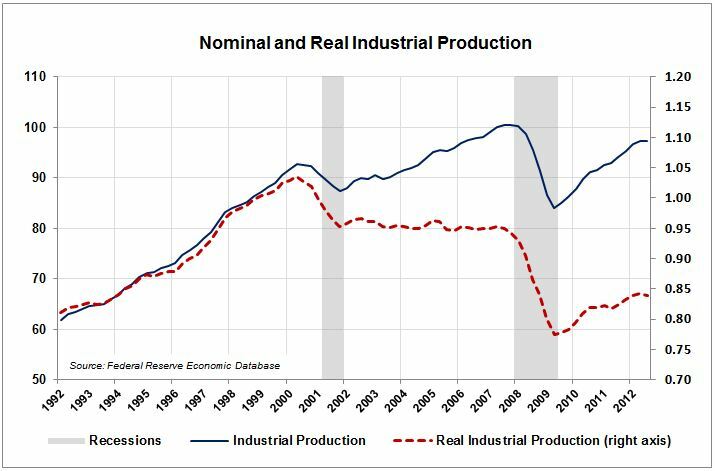 The inflation adjusted industrial production index fails to increase during the 2002-2007 expansion, although it decreases sharply with the 2008-2009 recession and rebounds weakly before resuming a sideways trend. Although both series have been increasing slightly since the last recession, the series did not manage to grow over the past 12 years, which is not indicating current economic expansion. Therefore this indicator will receive a diffusion index of zero. Lagging Indicators. The students’ rankings for the Conference Board’s seven lagging indicators are shown in the table below; detailed notes follow. The Average Prime Rate is a benchmark used for pricing loans. 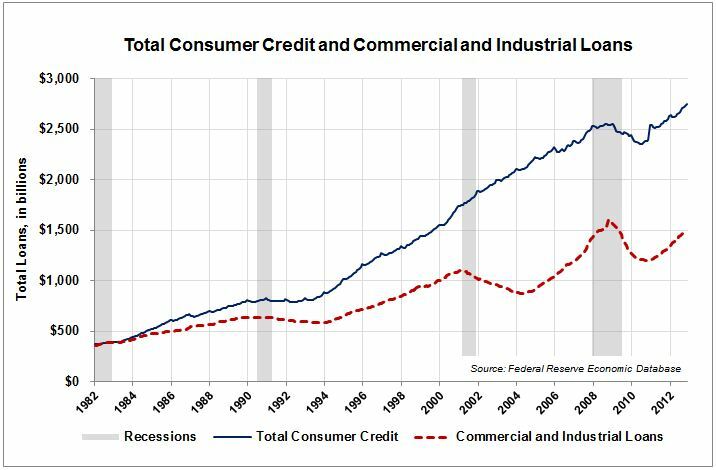 The indicator trails the economy as banks set the price of credit. The demand for credit will grow if the economy has been expanding, and banks can mark up the price of credit and charge higher rates. 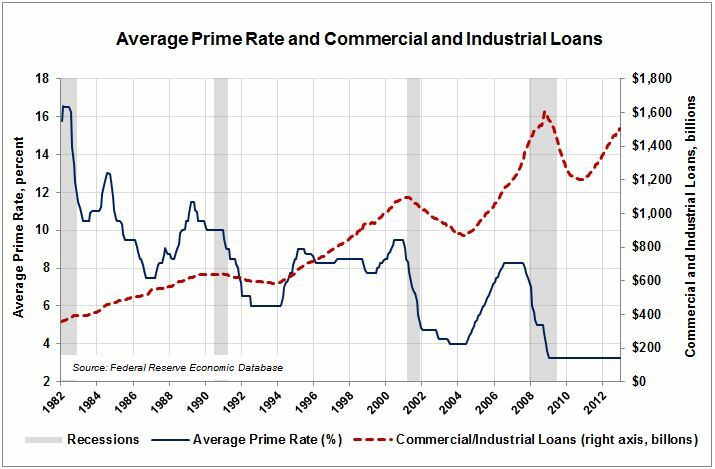 Commercial and Industrial Loans depicts the level of the interest rate regardless of total loans outstanding. If new credit is not created due to low rates, the economy may not expand. The Average Prime Rate functions more like a leading indicator heading into recessions as the US Federal Reserve begins cutting interest rates in anticipation of future economic weakness. During the last three recessions, it acted as a lagging indicator, increasing well after the end of the previous recessions. The Average Prime Rate has been in a secular downtrend for the past thirty years, declining with the general decrease in inflation and interest rates for the same period. The Prime Rate has remained very low rate due to the Fed’s commitment to zero interest rate policy ever since the 2008-2009 recession. Low interest rates have contributed to the rebound of commercial and industrial loans. The Prime Rate could not be much lower, and business loans are increasing, therefore this indicator is scored +1. Consumer Credit to Personal Income functions as a lagging indicator. Consumers normally wait to increase borrowing for at least 3 to 6 months after a recession ends and they can see tangible signs of economic recovery. 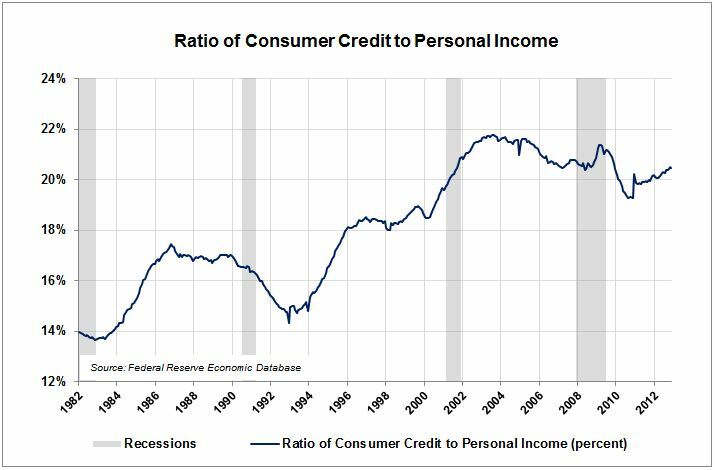 Consumer credit to personal income functions well as a lagging indicator around 1981-1982 and 1991-1992 recessions. During the early 2000s credit bubble, the current value of the series becomes hard to discern. Early in the 2008-2009 recession, the ratio began a sharp decrease, which means consumers offset the lost income during the latter part of recession by increasing borrowing relative to income. As teh recovery began, the ratio declined as income grew and consumers reduced debt. In the recent two years, the ratio began to climb back close to its last high point, which may suggest that total personal income has grown to the point that consumers feel comfortable increasing their total borrowing once again. The series decreases by 1% after each recession, which means consumers still have old debts to pay off before a new cycle of consumer borrowing begins. In the long term, the main trend of this series is upward. Therefore the indicator will be rated as a +1. 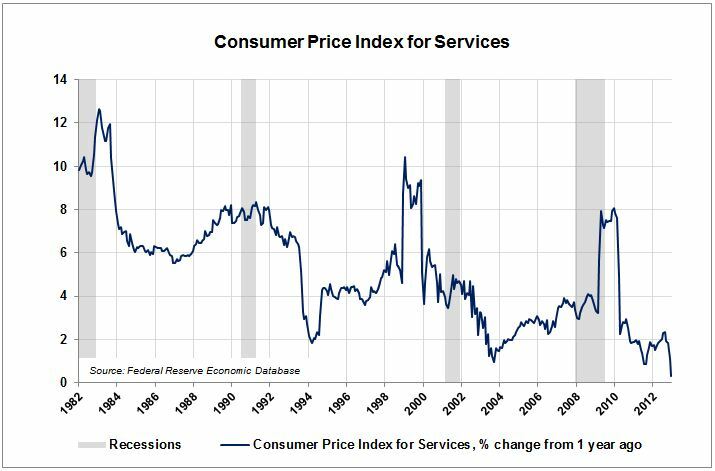 The Consumer Price Index for Services is a lagging indicator that measures the percentage increase or decrease in the cost of services over time. The index only sometimes (1983 and 2009) lags behind the economy, other times (1988 and 1998) it reflects increase in service costs before a recession. Notice how the index increased sharply (4.4%) following the 2008-2009 recession, but has decreased by a greater percentage (7%) since. The index is decreasing on the whole, indicating a decline in the cost of services over time. Note that the index has not reliably lagged behind economic changes. Nonetheless, the comprehensive decrease in cost of services suggests recovery from the most recent recession. This index receives a +1. The index of commercial and industrial loans is a lagging indicator that measures the amount of consumer and commercial borrowing. Troughs in borrowing usually occur a year or more after a recession ends. Consumer borrowing has risen at a faster pace than commercial borrowing. After recessions, commercial borrowing decreases more than consumer borrowing. After the 2001 recession consumer borrowing did not slow down at all. Both consumer and commercial borrowing have reached or exceeded their pre-recession levels indicating the economy has recovered. In the past, borrowing has steadily increased, with the exception of post-recession periods. Currently borrowing is increasing again indicating economic growth. This indicator therefore merits a diffusion index score of +1. The Inventory to Sales Ratio Index is a lagging indicator that measures the amount of inventory held as a percentage of sales. The index reliably decreases by a larger percentage than normal after a recession. Notice how the index increases significantly before or during a recession and decreases at the end of a recession. The index has remained relatively unchanged (between 1.25 – 1.30) since 2010 indicating an Inventory to Sales Ratio similar to pre-recession conditions. 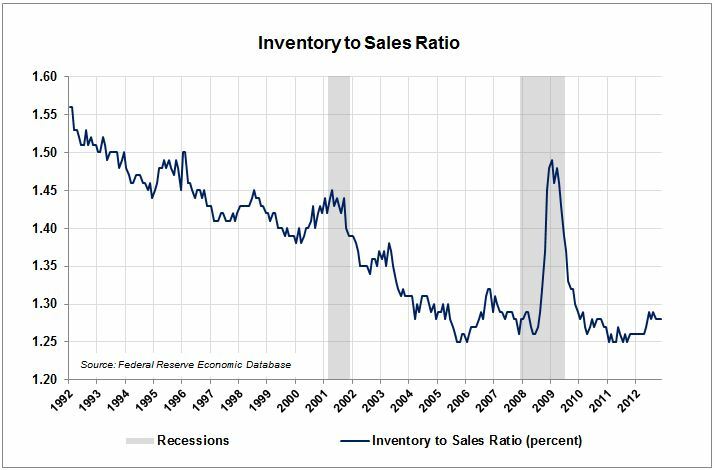 Significant increase in Inventory to Sales hasn’t consistently lagged behind economic recessions. However, significant decreases in Inventory to Sales Ratio have reliably indicated the onset of and expansion phase. Therefore, this index receives a +1. The index of unit labor costs is a lagging indicator that measures amount of labor cost per worker and the real amount of labor cost per worker (which considers inflationary effects). Labor cost per worker usually peaks midway through a recession and decreases about a year after a recession. Notice how unit labor costs are increasing while real unit labor costs are decreasing. Unit labor cost increasing indicates U.S. businesses are adapting to higher wage demands from workers. 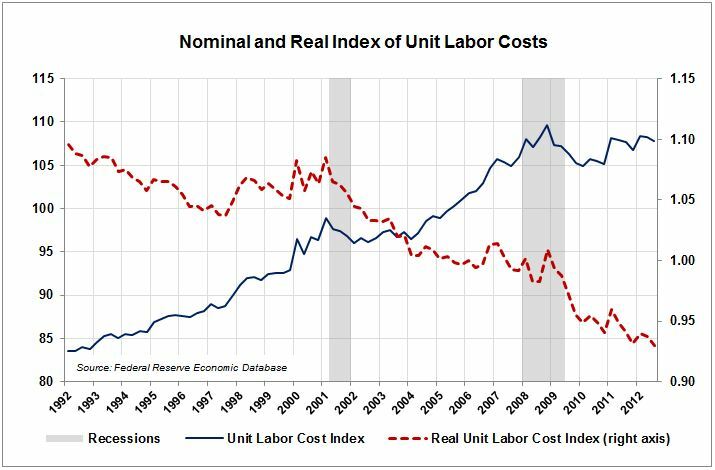 Real unit labor cost indicates the unit labor cost increase has increased slower than the rate of inflation, however. An increase in unit labor cost since the last recession shows economic growth. The continual decrease of real unit labor cost indicates workers’ wages are not keeping up with inflation. Therefore this indicator receives a score of zero. The indicator of average duration of unemployment is a lagging indicator that measures the average weeks a person is unemployed. The labor force participation rate is also depicted. Duration of unemployment has increased during recessions and continued to increase for about a year after recessions before slowly declining. The labor force participation rate has steadily been decreasing and not shown any sign of turning around since the 2001 recession. Notice that duration of unemployment hit an all-time high after the 2008 recession and has only recovered about one-fourth to the level it was before the recession. 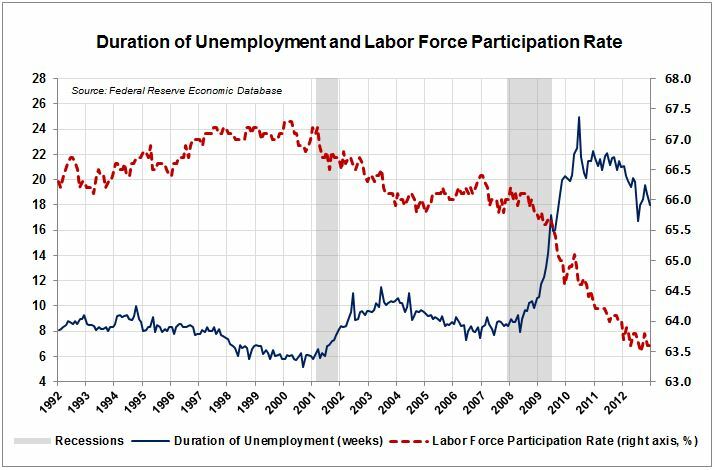 Also, the labor force participation is at an all-time low. Unemployment and labor force participation have not recovered since the 2008 recession. The average duration of unemployment indicates little or no economic expansion. This indicator therefore merits a diffusion index score of -1. S&P 500 Decouples from China and Brazil Apple, Inc. Technical Analysis Update: Is the Negative Price Momentum Over?